Pelosina variabilis, copyright Jan Pawlowski. The Saccamminidae are a group of Foraminifera with agglutinated tests known from the Ordovician to the present (Loeblich & Tappan 1964); it is likely that this represents a polyphyletic assemblage of relatively simple-bodied forams. See also: A small bag of grains (Taxon of the Week: Saccamminidae); Three random foram genera (Taxon of the Week: Pelosininae). Characters (from Loeblich & Tappan 1964): Test free or attached, subglobular, or in groups; aperture absent, single, or multiple. [G96] Gooday, A. J. 1996. Xenophyophores (Protista), including two new species, from two abyssal sites in the northeast Atlantic Ocean. 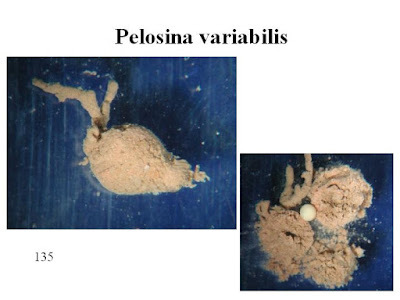 Journal of Foraminiferal Research 26 (3): 193–208.